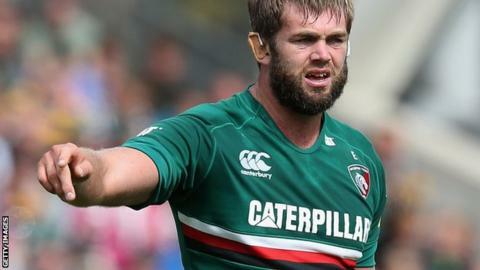 Geoff Parling may play his first Leicester Tigers game for over four months on Saturday against London Wasps after recovering from shoulder surgery. Parling was injured playing for England in November, and has started just four matches for the Tigers this term. Leicester boss Richard Cockerill admits the lock, 30, is yet to fully prove his fitness ahead of the Wasps clash. "If he gets through training today and Thursday, he will be available for selection," said Cockerill. Talking to BBC Radio Leicester, Cockerill continued: "If guys are fit and playing at 99%, they will be out there playing. "We will look at the squad and pick what we think is the right squad to try and beat Wasps." The return of British and Irish Lion Parling comes as a timely boost for the reigning Premiership champions, with four regular season games remaining. While Leicester's Heineken Cup run was ended by Clermont at the quarter-final stage on Saturday, Cockerill's side moved up to third in the Premiership table with victory over second-placed Northampton last month. "There are six games left if we get to a final, so there is not a huge amount of rugby left," said Cockerill. "It is a real focus now - if we can win all six we are champions and if we win the next four we might have a home draw for the semis, so we have to concentrate on that."